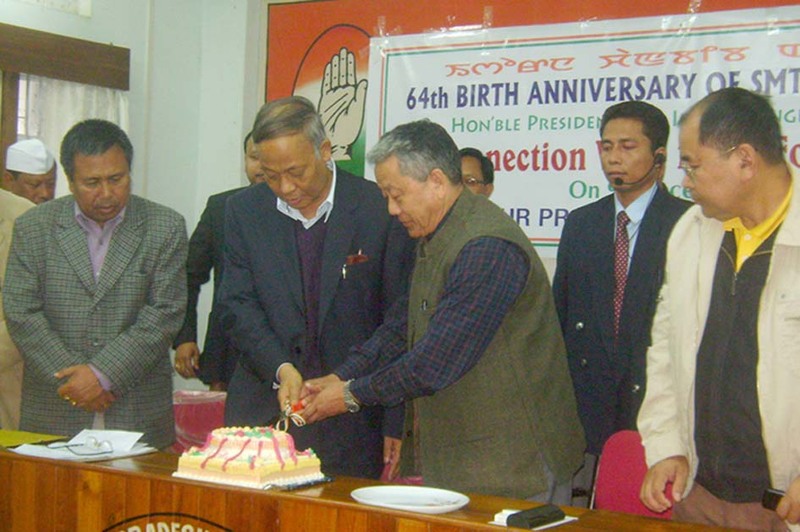 IMPHAL, Dec 9: The Manipur Pradesh Congress Committee (MPCC) celebrated the 64th birth day of the AICC president Sonia Gandhi today at the congress Bhavan BT road Imphal. The celebration was held with pomp and gaiety as president MPCC Gaikhanagam and Chief Minister O. Ibobi Singh distributed sweets and gifts to the orphanages and the people living under poverty lines by visiting different health care centres and hospitals today. As a part of the celebration MPCC president, Gaikhangam and the MPCC Youth president M Prithiviraj have jointly visited the Faith Home Sangaiprou Imphal and the Puinya Shelter Home for girls Thangmeiband Yumnam leikai and distributed sweets, blankets and other items. While speaking at a simple function held at the orphanage home ‘Faith Home’ this evening MPCC president Gaikhangnam has said that the Congress Party is entering its 125 years of existence and rendering services to the nation and its people, and that the celebration was organized by the congress workers to prove that they are proud to be a congressman. He further added that the celebration also had the objective of showing some love and affection to all the people living in acute poverty and especially to orphans. Party representatives and members had also visited various orphanage and hospitals and distributed sweets and gifts to the inmates and patients as a part of the birthday celebration of the AICC president Sonia Gandhi. The MPCC president Gaikhangam and Chief Minister O. Ibobi Singh also celebrated the occasion by cutting a cake at the MPCC office today. Meanwhile The MPCC president and the state chief minister along with the ticket committee of MPCC and other officer bearers held a joint meeting today in connection with the declaration of candidates for the Party in the ensuing Nagar Panchayat and Zilla Parishad election which is scheduled for January 3, 2011.